"Hate is a dish served best fast and hot"
It's no secret I've made a work of learning to kill in the Sopwith Camel. What some might not have guessed until recently is I'm a closet Spudlover. 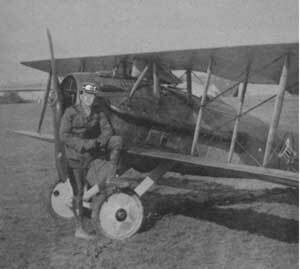 Yep, I'm talking about La Petite Potatoe twins, the SPAD VII and SPAD XIII; fast as a frat boy in a pick-up bar, tough as week-old bacon, stable as Grandma's Buick. Ever since Sierra/Dynamix gave up on the new flight models for RB3D and released the half-baked flying bricks we're saddled with, these two crates have been widely considered next to useless aside from special roles or in the hands of a gifted (and stubborn) few. I say, "No longer." It's time these planes got the attention (and praise) they so richly deserve; in that light I've devoted a lot of time to learning how to use them effectively, both as part of a team and as a lone wolf hunter/killer. I make no claims to absolute authority here, and my methods are far from the only way these planes can be used to Spread the Hate, but they work for me. They're also not rocket science, merely applications of tried-and-true maxims of "energy fighting" to the particular quirks of the Spuds. Plan ahead. You're not going to get a Spud to do anything fast except go forward, so be thinking like a chess player. Time your arcing turn to come around guns-on just as that fast-turner will have their six to you while yank-n-banking to get on someone else. Use the buddy system. I've been doing some really cocky solo stunts in them of late, but in general it gets me killed more often than not. You need a wingie so you can clear each other's six when some uebered-up D7 or P3 locks onto you. Your best tracking angles are going to come when the target is lining up on someone else. Use minor control inputs. You'll find almost no difference between the response at 20% and 90% stick deflection, except in the latter you'll bleed faster. Stay totally away from the rudder except for lining up snapshots, hammerhead reversals, and adding to roll rate at the top of a half-loop when speed is already low. Let go of the stick often, and let the plane have her head. Zoom, zoom, zoom. Never give up alt for speed unless you're running for your life or will be reclaiming most (if not all) of it after your attack pass. If you start with alt and are aggressive about keeping it you can stay above everything in the air, even a D7 (until it uebers). Zoom at a bank angle to save time, then at the top finish the rollout using aileron and rudder. With practice you can easily stabilize and then start accelerating on the level even though you'll be almost at stall for a second or two. Spiral to the left against P3s, they stall in hard left banks if they get too slow. Be fast. The only times you should be slow is at the apex of vertical moves; and then level out or nose down and get that speed back up, pronto! If you get slow that Alb or D7 is going to get co-alt with you and still have some smash, and then you're in trouble. Be patient. Spiral with them for hours, if needs be. I once let two P3s chase my S7 up to 14k feet before things lined up where I could make a pass or two on them and still have angle to extend afterwards. Don't push a bad position to get a shot. If it looks bad pull off at once and start over. Use roll to line up for the shot; if you can't line up almost exclusively with roll it's not a good shot opportunity. Forget that and bleed to your doom. Run if things get bad. Extend on the level if you can, dive like Hell and make constant, random and aggressive rolls all the way down if you can't. Yell for help and angle towards your wingie(s) so they can help clear your six. Once someone locks onto your six with a good gun solution it's going to be hard to lose them unless you have much better E and can zoom away. If you get clear and are all alone with Huns chasing you, level off and then begin a shallow climb. When/if you get sufficiently above them you're ready to come about and re-engage -- especially if they get frustrated and turn away first. Keep the pressure on. Any time they falter even a bit in the spiral, dip your nose and fake a pass at them; try to get them to bleed in a break turn or to dive away to evade. You've just gained more E on them and the next pass will line up that much faster. Make them aware you're eager to jump every second, and keep them tense; they'll make more mistakes. Have fun! These are crates for grand, sweeping gestures at high speeds and I'm finding I can't get enough of them. Some days you'll get no kills at all, some days you'll rack up 3-4 in a single sortie -- but you'll die much more rarely than when mixing it up in the turnfighters.